Overview Katmai National Monument was set up in 1918 to protect the Valley of Ten Thousand Smokes. It is actually a super exotic 700 foot deep ash flow deposited by Novarupta Volcano and covers some forty square miles of wilderness. Katmai was designated as a National Park & Preserve in 1980. Now of course the main draw is for those seeking the crazy world of volcanoes. Some come here for the big brown bear siting, clean water and great fishing. This rugged coastline is spectacular. 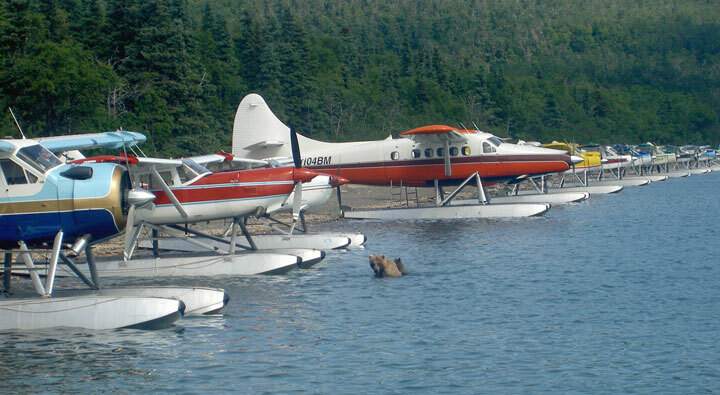 Picture shows a mother bear and cub fishing for salmon right under some floatplanes Naknek Lake beach. Sport-fishing is the number one activity here in this particular Alaska preserve. Big trophy sized rainbow trout are everywhere in most of the lakes and streams. This area is also home to grayling and dolly varden which you can't find very many other places. Both sockeye and silver Salmon can be found in some areas of the park though the location varies by season. 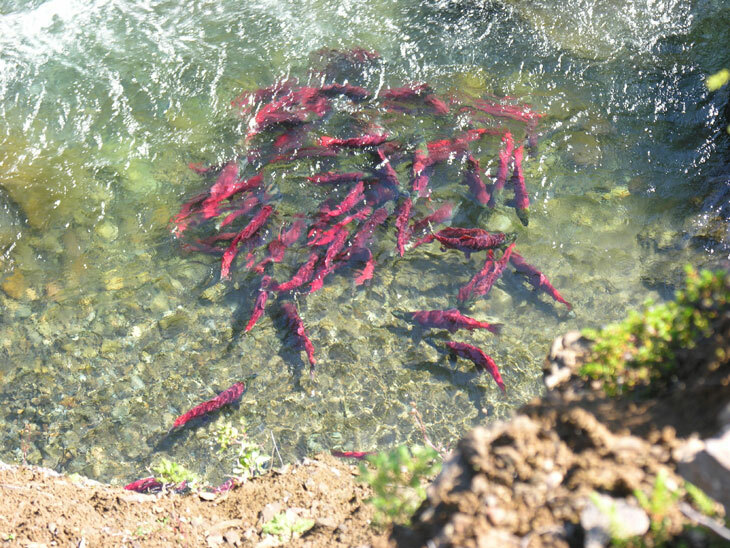 Picture shows Sockeye Salmon which are the most special species in Katmai's ecosystem. Every living thing here benefits one way or another from the salmon being healthy and plentiful. The Rainbow Trout, Arctic Terns, Muskrats, Brown Bears and of course all the plants and plankton. Bear viewing Katmai is one of the best places to see big brown bears in all of the world. As of 2010 there were at least 1900 brown bears in the park and preserve. Brooks Camp sees a big congregation of brown bears eating sockeye salmon at the both Brooks River and Brooks Falls. Viewing platforms were installed so you can watch them without getting eaten or disturbing them. Up the coast in Geographic Harbor and Hallo Bay also have lots of sightings. In the preserve itself both Moraine Creek and Funnel Creek see alot of bears. Bears show up when there is food, pretty simple actually to see them here. Picture of Mount Griggs named after Robert Griggs who discovered the Valley of Ten Thousand Smokes. Cultural Walk Peepse have been living off the land here in Brooks Camp since before the time of the Egyptians when they were building pyramids over 4000 years ago. 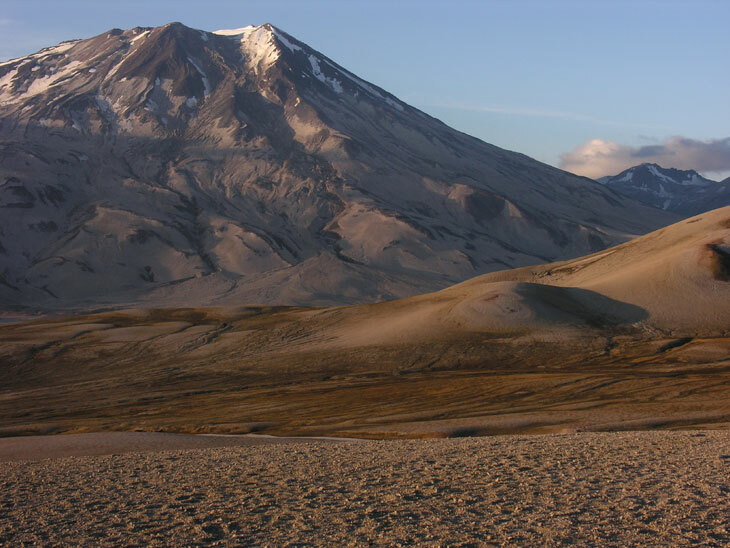 Here our archeological sites show Katmai National Park work and population activities that date back nearly 9,000 years ago. Vanabode Special Notes: Even though Alaska can be extraordinary and Vanabode offers the absolute safest, easiest, cheapest, and fastest way to get there, I still cannot recommend this destination unless you go here only in the summer and play it very very safe. I have not been here to this park and cannot state for sure that you can do it on $20 a day. Campsites are typically never less than $20 a day and since you must fly in to get here there is no free parking. It is rugged and wild and the inclement weather can be devastating. If you do travel during the very warmest months please do some heavy research and planning so that your van is outfitted for Alaska's extreme temperature swings, rain and bugs in Katmai National Park & Preserve Alaska.